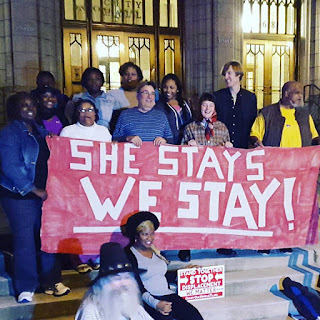 Last night, the residents and their supporters held a rally and camped out all night on the steps of City Hall to emphasize the point that if Ms. Mattie stays they stay. 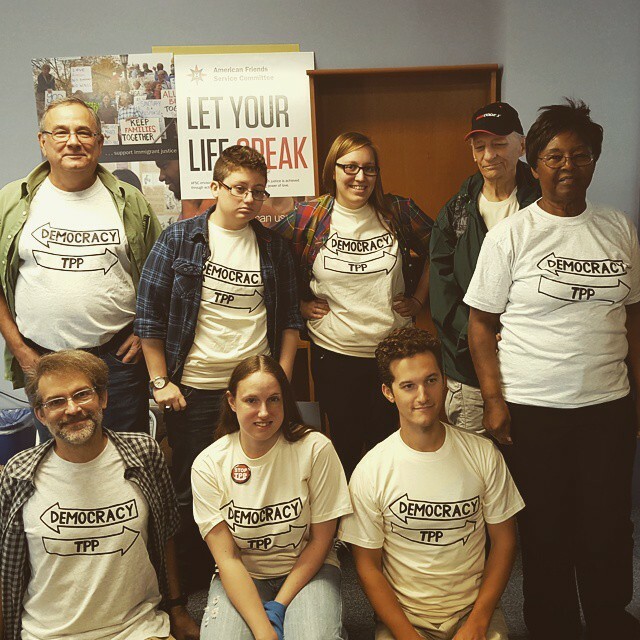 American Friends Service Committee was excited to be the in support along with leaders from Occupy Our Homes Atlanta. Most who committed to stay though the night had never done anything like it before and what was initial nervousness about the bold tactic quickly turned into the joy that often comes with participating in collective action driven by a righteous goal; in this case, saving the homes of residents that helped build the community they love. 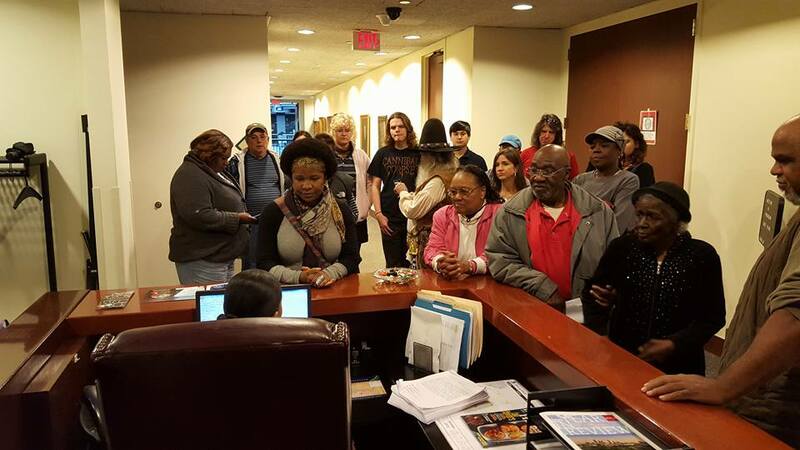 After holding a 10 am press conference this morning they presented a letter to the Mayor, supported by a petition with 5394 signatures, respectfully requesting that he meet with them to address their right to also stay in their homes. The Mayor's office refused to even schedule a meeting with the residents, who had camped out all night in anticipation of getting some word from the mayors office about their homes. The residents and their supporters plan to return to the Mayor to demand the meeting which he promised. We are of course disappointed with Mayor Reed's continued dismissive stance towards these Peoplestown residents but we remain hopeful that he will do right by them as he did right by Mattie. After last night a few things are clear. This fight will not go away, it will continue to escalate as residents make it clear they will not leave their homes. 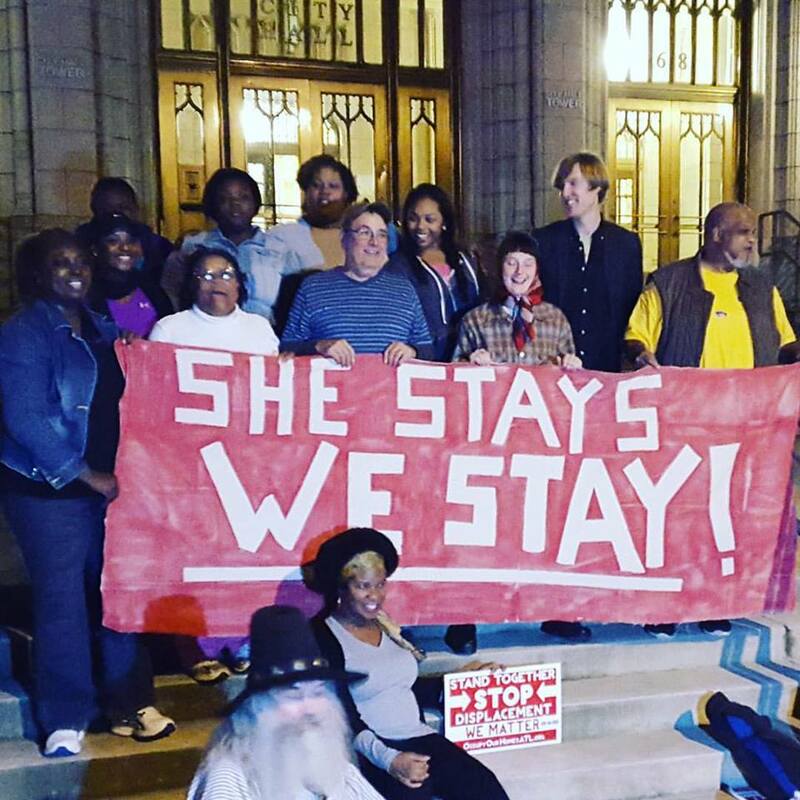 It also seems clear that these residents have already won and they know it, their supporters know it, it's just going to take city council and Mayor Reed some time and possibly more creative direct action to figure it out. 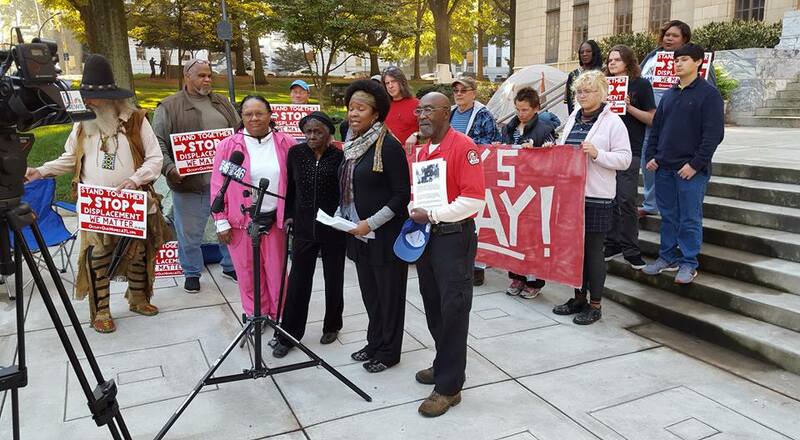 After two sit-ins at his office and over 5k signatures on a petition Mayor Reed agreed to take hands off Miss Mattie Jackson’s and allow her to stay. 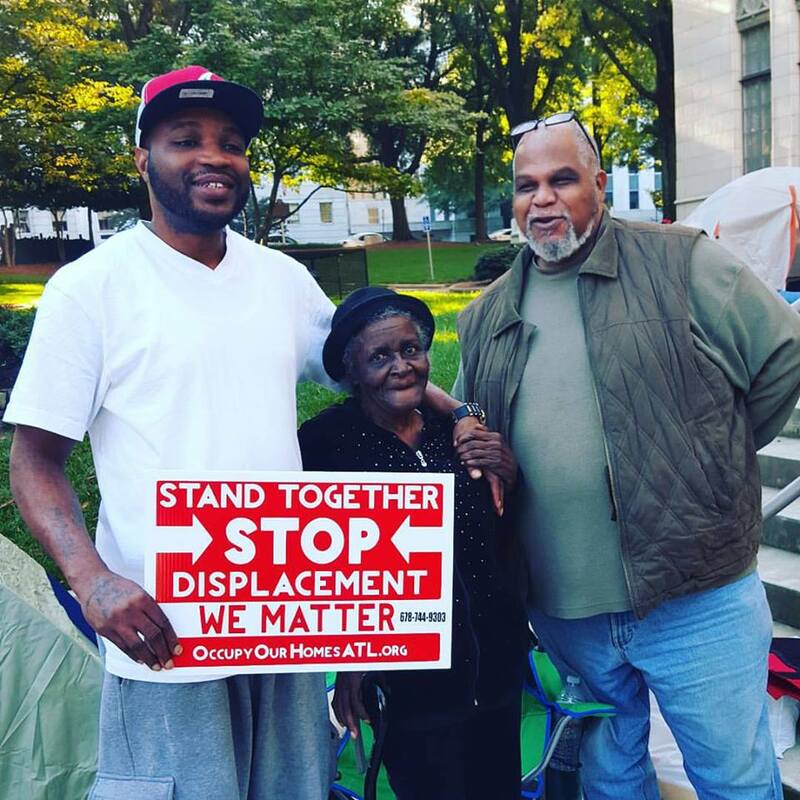 The all-night vigil will end with a Friday 10/23 10am press conference and a letter delivery to Mayor Reed’s office requesting he meet with remaining residents. 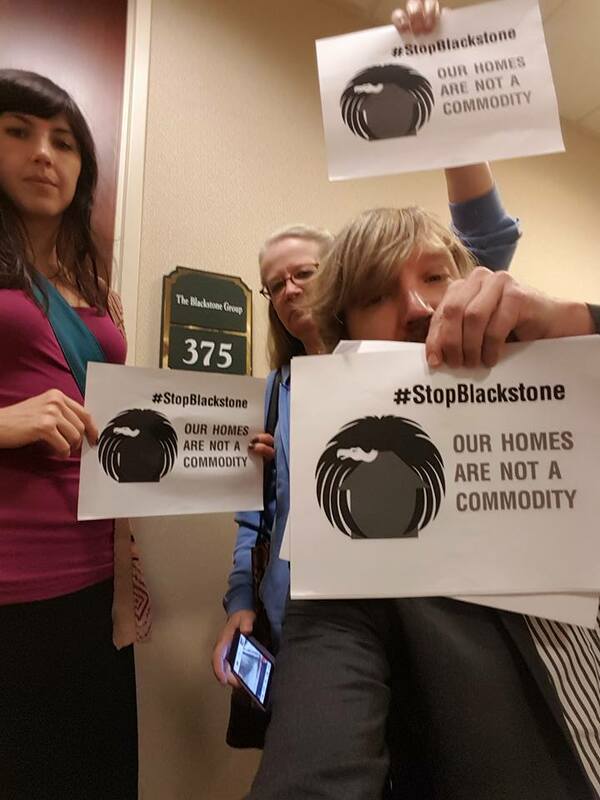 Stand with Blackstone tenants around the world in demanding justice from CEO Schwarzman! Our Homes Are Not a Commodity! No Business As Usual Today -- Shut Em Down! Today members of Occupy Our Homes Atlanta delivered a demand letter to Blackstone Groups Atlanta Head Quarters. We encourage you to take the time to make a call/email as people around the world take a stand against Blackstone's unfair, exploitative housing practices. Can we count on you to make the call? Blackstone, one of the world's largest private equity firms, is buying up housing all over the world and quickly becoming one of the largest landlord's in our cities. But at the expense of families and communities. Blackstone buys up our foreclosed homes for cheap, kicks out the residents, charges exorbitant rents, fails to do proper maintenance and excludes people of color and immigrants! By calling in you are part of an international day of action spanning 4 countries and 3 continents! TODAY, Right To The City and PAH in Spain are organizing protests at Blackstone offices in the US, Spain, Japan and England! In the US we are doing actions and delivering demand letters in cities across the country including New York, Atlanta, Chicago, and Seattle. Our call in's will be happening in over 40 cities worldwide!!!!!!!!!!! We are just getting started and in the future, we plan to expand our organizing and protests to everywhere Blackstone is, including China, Australia, and India. Our international demands are below and will be paired with local demands in each city. Blackstone is one of the world's largest private equity firms. Blackstone made big money in the last housing bubble and now is cashing in again to make lots more. It is buying up housing and real estate all over the world and quickly becoming one of the largest landlord's in our cities. They are raking in the profits. But at the expense of our families and communities. They buy up our foreclosed homes for cheap, kick out the residents, charge exorbitant rents, fail to do proper maintenance and exclude people of color and immigrants! Do NOT destabilize our communities by buying homes that should be owned by individuals, the government or local entities. End the purchase of homes owned by banks rescued with public money or homes that were purchased with sub-prime loans. Stop forcing tenants out of homes due to harassment, your failure to make repairs and charging unjust fees. Do not discriminate against people of color or immigrants including by using unfair prohibitions regarding former incarceration or arrests, and/or immigration status. 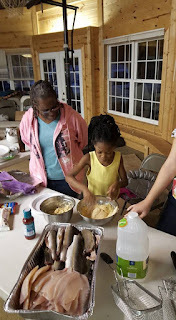 Allow equal access to Blackstone homes for all people regardless of race, nationality, age, gender, sexual orientation, disability, family status, immigration status, former incarceration, eviction history or credit history. 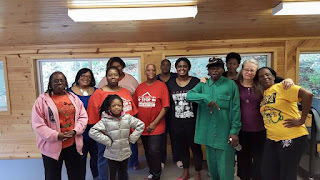 This past weekend American Friends Service committee was proud to support and participate in a retreat with Occupy Our Homes Atlanta and the newly formed SMP Housing Justice Movement. SMP stands for Summerhill, Mechanicsville, and Peoplestown. The retreat brought together longtime resident fighters from Occupy Our Homes Atlanta and tenant leaders from newly formed tenant associations in Peoplestown, Summerhill , and Mechanicsville. 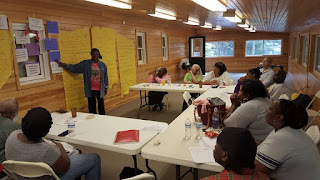 The focus of the retreat was building a stronger structure to build power in neighborhoods surrounding Turner Field. Tenant leaders took time to build a mission statement, organizing principles, a code of conduct, and an organizational structure. 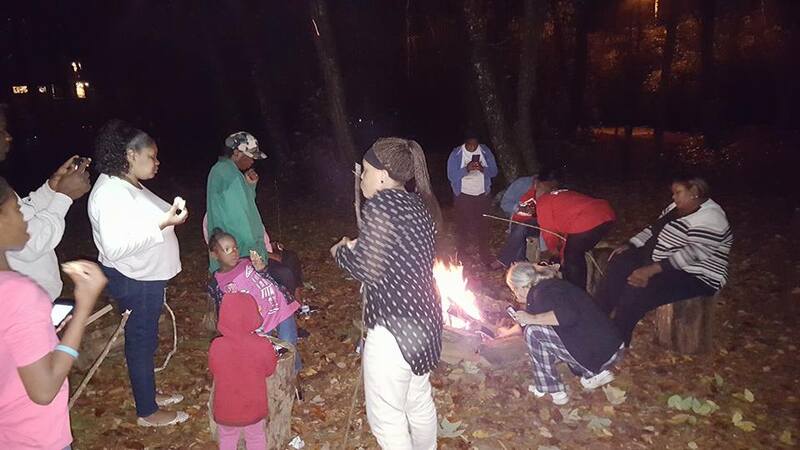 The retreat also created space for folks to build stronger bonds with each other, sharing stories over meals and around the campfire, and sharing hopes and dreams for the future of the communities we're fighting to preserve. The communities surrounding Turner Field have the cities eye of development squarely fixed on them. Atlanta intown neighborhoods have seen massive development which has brought mass displacement in places like the Old 4th Ward, Kirkwood, and Reynaldstown. A drive through parts of the Turner Field Communities would tell most that development could be a good thing, in fact most residents would like to see positive development in their communities but not if that means they have to leave. Atlanta needs to find a way to develop without displacing the very folks that have been holding it down for generations and we know it's possible. Gentrification isn't just racist development, it's lazy development that strips a community of its flavor and history. We're inspired that a group of tenant leaders are stepping up to lead their fight, a fight that could change the way our city is developed in the future, a fight that could challenge the status quo of development deals that benefit a few rich folks and hurt are cities most vulnerable. 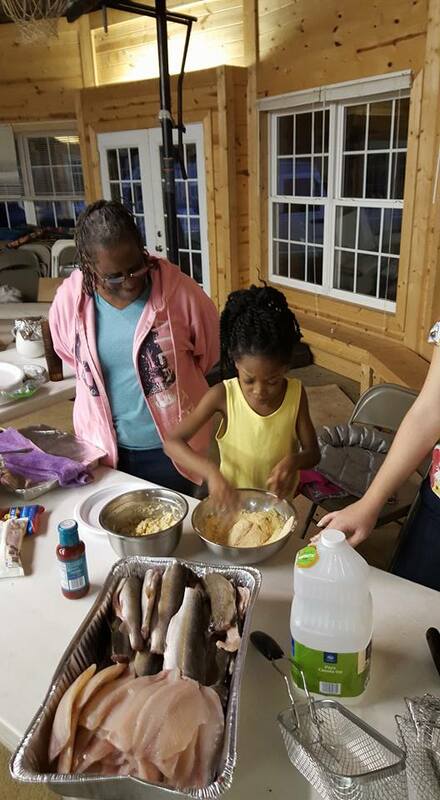 AFSC is proud to be in their corner and look forward to supporting the housing justice movement soth of I-20. The SMP Housing Justice Movement is hosting a meeting this Thursday October 15th, attendance is encouraged. As the Trans-Pacific Partnership (TPP) trade talks unfold in Atlanta in an effort to finalize the pro-corporate deal, the quickly formed Atlanta #StopTPP Coalition, which includes American Friends Service Committee has come together to organize a number of rolling nonviolent actions to make it clear that the anti-democratic trade deal is not in the best interest of regular everyday people around the globe. 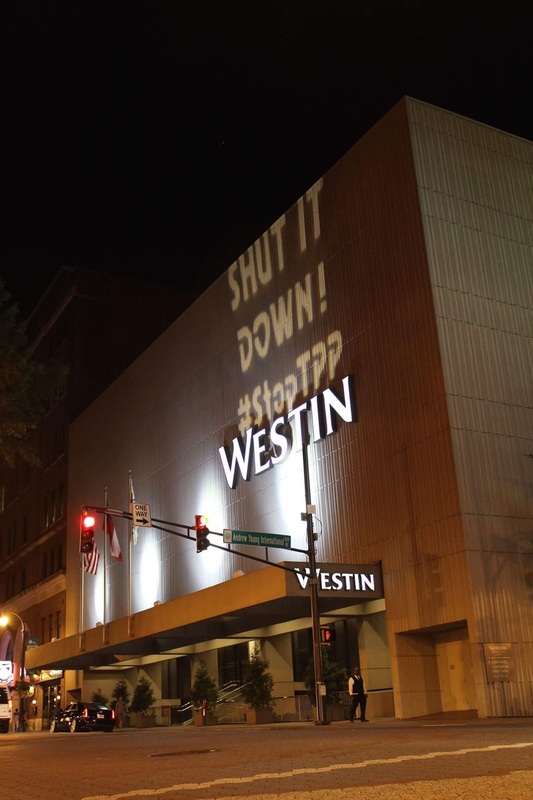 The citizens in Atlanta and the global community have continued to nonviolently resist the agreement. We won’t stand for a wholesale auction of our rights, our freedoms and our democracy to multinational corporations who put profits over people. The Atlanta and global community will not stand for the TPP corrupting our democracy and eliminating our rights by putting corporations such as Walmart, Chevron, Cargill, and McDonalds in greater control of our daily lives leading us into a global race to the bottom. The undemocratic and secretive TPP would threaten good jobs, public services, access to affordable life-saving medicines, the environment and our climate, consumer health and safety and much more in our communities across the world. 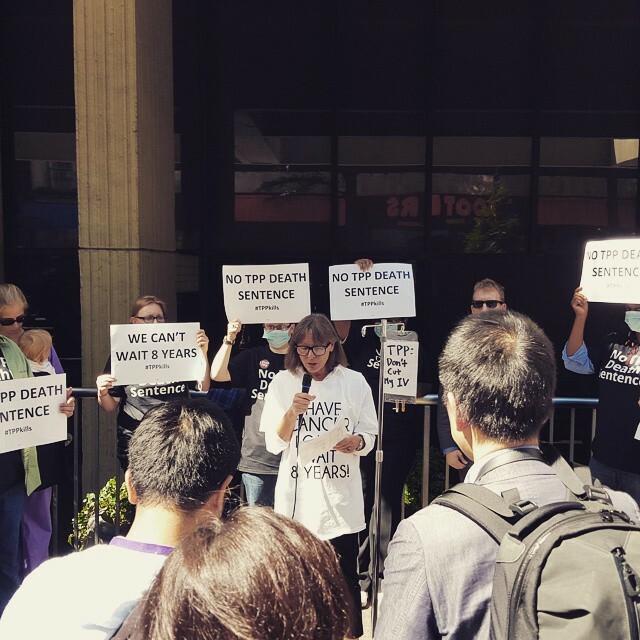 Yesterday, during the TPP negotiations, cancer patient Zahara Heckscher was arrested after disrupting the negotiations for the Trans-Pacific Partnership (TPP) in a protest aimed at maintaining access to affordable cancer medicines in the 12 countries affected by the trade treaty. Heckscher, in a t-shirt reading "I HAVE CANCER. I CAN'T WAIT 8 YEARS", and holding an IV pole that read "TPP: Don' t Cut My IV,” refused to leave the Westin Hotel, the site of the negotiations between U.S. Trade Representative Michael Froman and the other TPP trade ministers. She demanded that they show her the secret TPP text to verify for herself and other people living with cancer around the globe that TPP would not include a "death sentence clause," the text of the U.S. proposal to extend de facto monopolies on biological medicines by up to 8 years. Heckscher, a seven-year breast cancer survivor, calls herself a cancer thriver. She has been treated by biologicals including trastuzumab (Hercepin) and pertuzumab (Perjeta). She is currently undergoing chemotherapy as part of a clinical trial, and continues on denosumab (Xgeva) treatment as well. According to Heckscher, "For thousands of women to die unnecessarily of breast cancer because of the TPP is a horrible, cruel, premeditated, and avoidable catastrophe. The provisions being decided by TPP ministers today could allow drug monopolies on biologics for 8 years. Some of these medicines cost up to tens of thousands, even hundreds of thousands of dollars a year." "When you have breast cancer today, you can’t wait 8 years or 7 years or 6 years for a treatment to become available or affordable. When you have cancer, even a one-year delay in affordable medicine can be a death sentence. That is why we call this proposed provision of the TPP a 'death sentence clause.' If it passes, thousands of women like me will die waiting." As the day progressed there were dozens of creative actions including a disruption of a TPP reception hosted by the Atlanta Chamber of Commerce and the use of high powered projection devices to project images on the hotel negotiations are taking place in. Today community members disrupted the lobby chanting, "Stop TPP, no corporate greed" as longtime human rights activist Daniel Hanely attached himself to a railing on the floor that negotiations were happening. Daniel was eventually arrested and is still incarcerated. Daniel made sure that these trade negotiators got the message that the people across the world absolutely will not stand for these corporate dominated trade deals. Daniel took a big risk today, and his bail is likely to be high, please consider contributing and sharing his to his bail fund by clicking here. Today at 5pm hundreds of Atlantans will gather at Woodruff Park and march to the Westin where the negotiations are happening. Can we count on you to join?